Our guava tree produced a lot of fruit this year; however, some of them have brown spots on the skin, which spoils the inside of the fruit. 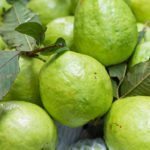 In addition to my question, what is the best way to ripen the guavas, as they fall on the ground when they are not ripe. We do have squirrels, possums and raccoons if we leave fruit on the trees they will eat all of them? If you leave unripe guava at room temperature for a few days they should ripen. Squirrels, raccoons and opossums relish guava so there is a distinct possibility they will be eaten.